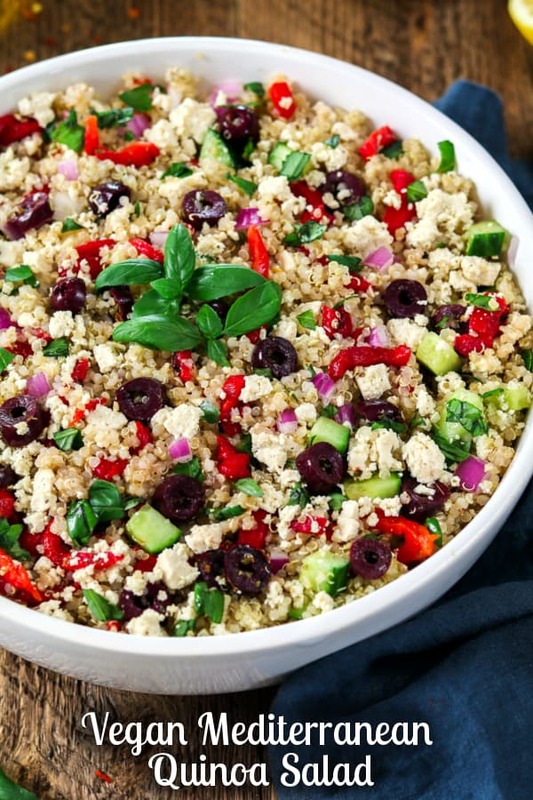 Mediterranean Quinoa Salad ~ The perfect summery dish! It’s fresh, satisfying and takes less than 30 minutes to make too. I went to a potluck last weekend and I brought along my Mediterranean Quinoa Salad. It was a total hit and I couldn’t believe how fast it disappeared! Oh, and it was mostly non-vegans digging in, so it was a proud moment for me. I received a lot of requests for the recipe that evening, so I figured I’d share it with you guys too. You’ll definitely want to bring it to your next barbecue, potluck or picnic. It’s super easy, tasty, and inexpensive to make. Plus, it can feed a whole herd of humans! And if you really want to impress them, you can bring along these Vegan Vanilla Cupcakes for dessert too. Now whisk it all together! In a small-medium bowl, whisk all the dressing ingredients together. 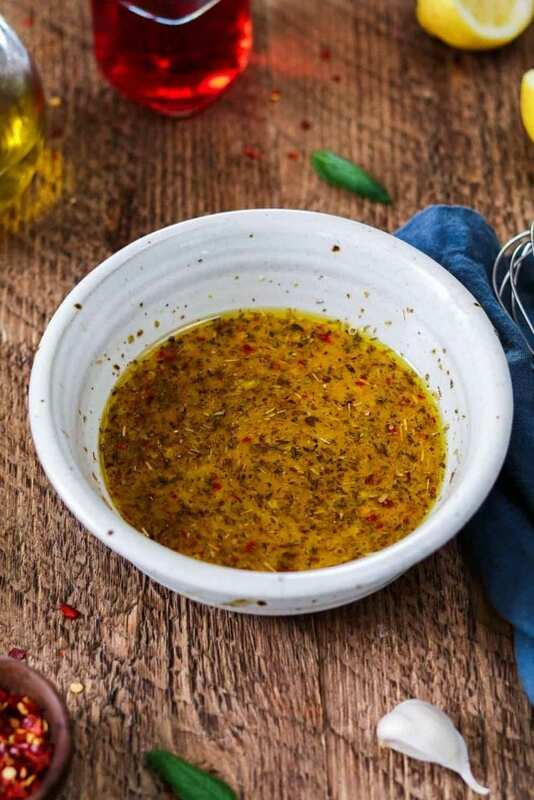 The dressing is easily adjusted by personal taste, so just add more or less of the listed ingredient amounts as needed. It might taste a little tangy or salty, but it will be spread over a lot of quinoa and veggies, so keep that in mind. Press and crumble the tofu. Lightly sprinkle it with salt and pour 1-2 tablespoons of dressing on top. Gently work it in with your fingers to coat. If you’d like a tangier flavor, add a small amount of lemon juice. 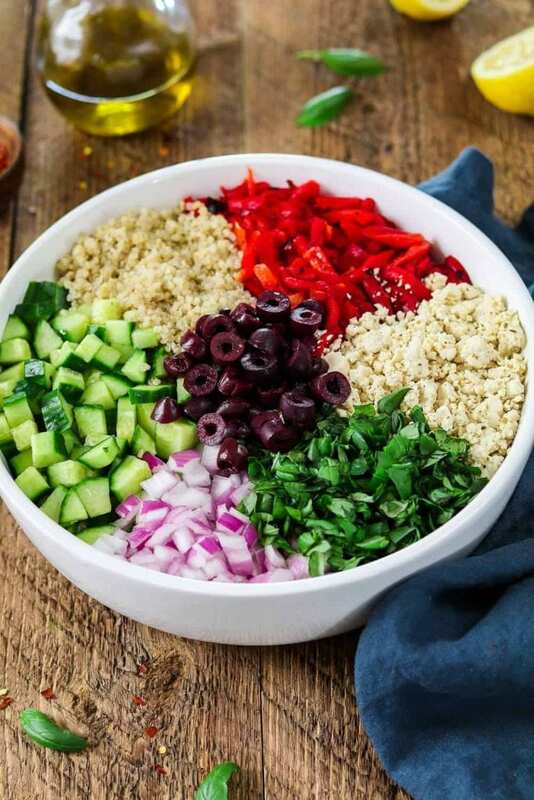 Now cook the quinoa, dice the red onion and cucumber, cut the red pepper into short strips, slice the olives and chop the basil. *Tip: I press the tofu and chop the veggies while the quinoa is cooking and it takes about 25-30 minutes to complete. To save time, you can press the tofu in the fridge overnight. * Also, you can buy jarred roasted red peppers that are pre-sliced to make things even easier. I buy these. Some of the strips may be a little long, so you might want to cut them in half. In a large bowl, add the cooled quinoa, onion, cucumber, olives, roasted pepper and basil. Pour the dressing over everything and gently toss to combine. Now taste for seasoning and adjust as needed. Top with the marinated tofu crumbles when you’re ready to serve. You can also place in the fridge for 1-2 hours to let the flavors marinate a little more (keep tofu separate until ready to serve). Taste again before serving. If needed, add a few squeezes of lemon, and a splash of olive oil to moisten. You can top with vegan parmesan, pine nuts, more basil and fresh-cracked pepper. This salad is so easy to customize, so feel free to omit ingredients that you don’t like, and add more of what you do. 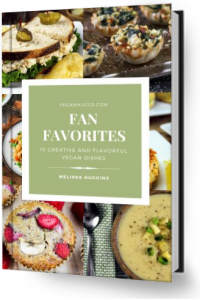 You can add things like artichoke hearts, capers, pine nuts, chickpeas, kidney beans, peas, corn, tomatoes, green onions, parsley, mint, sliced almonds, dried fruit and more. If you’re not into quinoa at all, but love the flavors of this recipe, you may like to try my Mediterranean Pasta Salad. It’s just as tasty! 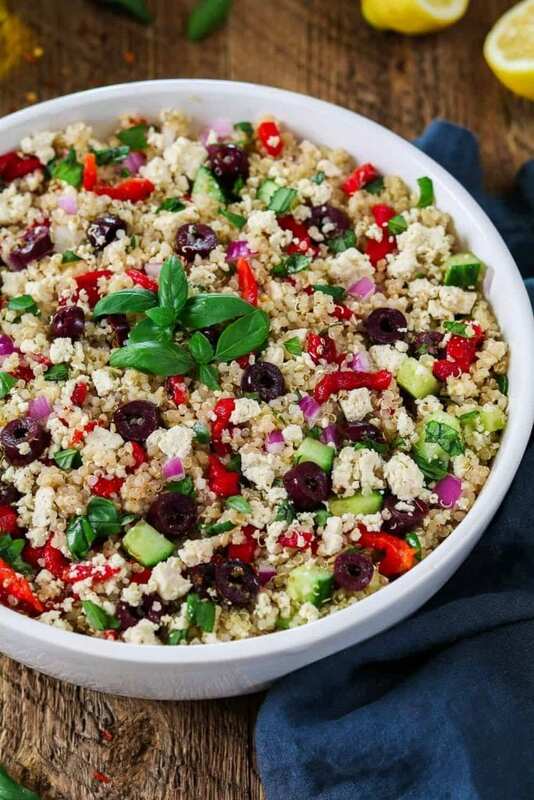 If you make this Mediterranean Quinoa Salad, let me know what you think by ★ star rating it and leaving a comment below. It would really make my day. You can also follow me on Instagram and share your creation with me. Just tag me @veganhuggs and hashtag #veganhuggs so I don’t miss it. Mediterranean Quinoa Salad ~ The perfect summery dish! It's fresh, satisfying and takes less than 30 minutes to make too. In a small-medium bowl, whisk all the dressing ingredients together. Adjust flavors as needed. It might taste a little tangy or salty, but it will be spread over a lot of quinoa and veggies, so keep that in mind. Set aside. Lightly sprinkle the crumbled tofu with salt, and pour 1-2 tablespoons of dressing on top. Gently work it in with your fingers to coat. If you'd like a tangier flavor, add a small amount of lemon juice (I do this). Set aside. 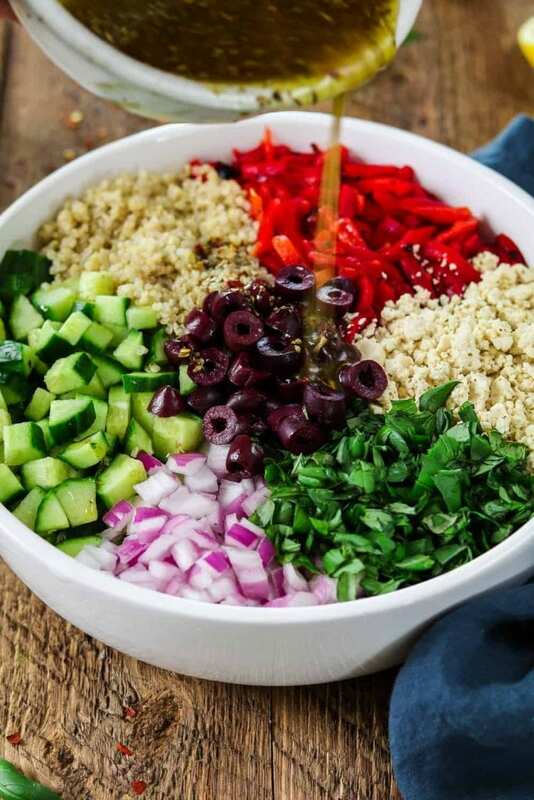 In a large bowl, add the cooled quinoa, onion, cucumber, olives, roasted pepper and basil. Pour the dressing over everything and gently toss to combine. Taste for seasoning and adjust as needed. Top with the tofu crumbles when you're ready to serve. You can also place in the fridge for 1-2 hours to let the flavors marinate a little more (keep tofu separate until ready to serve). Taste again before serving. If needed, add a few squeezes of lemon, and a splash of olive oil to moisten. You can top with vegan parmesan, pine nuts, more basil and fresh-cracked pepper. Enjoy! *Holds up nicely in the fridge for 2-3 days. *Pressing Tofu: wrap tofu in a few paper towels and place on a flat plate. Add another plate on top of tofu and add a heavy pan or book on top. Let it drain for 15 minutes. You can also press it overnight in the fridge to make it even quicker. *If you don't have time to press the tofu, just wrap the tofu in paper towels and gently squeeze out as much water as you can. Don't press too hard. * To save time cutting, you can buy the roasted peppers that are pre-sliced. If some slices are too long, just cut them in half. I must say I never cared for quinoa even though its one of the best complete proteins. So I am always trying to find a recipe or different way of cooking it to I can pallet it better. I made this last night and wow it was great. I had leftovers and even put it in a tortilla and it was great too. Many Thanks! Melissa, Potluck season is upon us and I always get a deer in the headlight feeling when asked to bring a dish. I love that this is fresh, seasonal, vibrant and hearty.